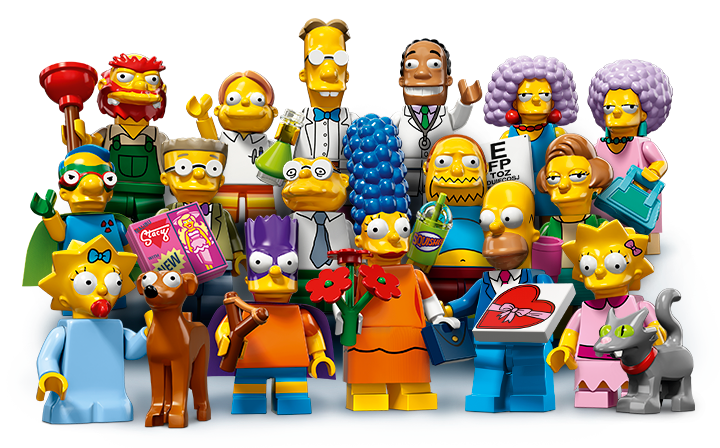 The Simpsons is back in town with the latest LEGO Simpsons 2 Minifigures.Since this is our third review of the LEGO Minifigures series, you would probably realise by now that I am an AFOL (Adult Fan of LEGO). It is good thing too that The Wacky Duo are fans too, so it gives me the excuses to hunt look for the latest LEGO goodies. There are lots of fantastic review on the set, our favourite site for the latest review is at eurobricks.com. 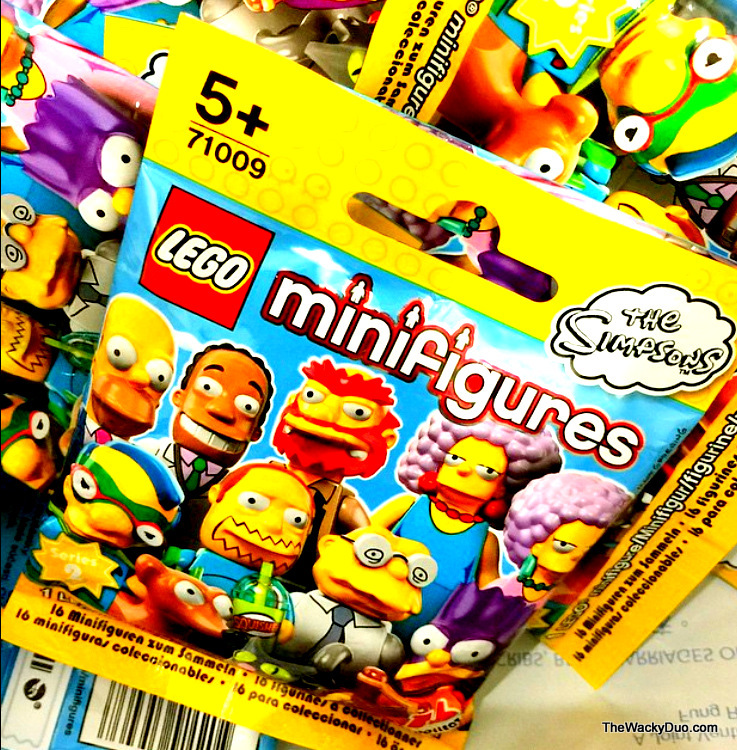 Since reviews are aplenty, we will just dive straight into the secret in selecting the right Simpsons minifigures from the sealed polybags, you know the good stuff for beginner collectors. Honestly the fun in getting the characters you wanted is the hunt for it. Once you successfully identified the character you wanted, a sense of pride would sweep over you. It's a feeling that AFOL or LEGO fans in general would identify with. Somehow the kid in us will never disappear. Homer is back in Simpsons 2 with a change of clothes. He is having a date with Marge in this series and is in matching gear with Marge. He is also one of the toughest to identify as he has similar accessories and size with Dr. Hibbert. 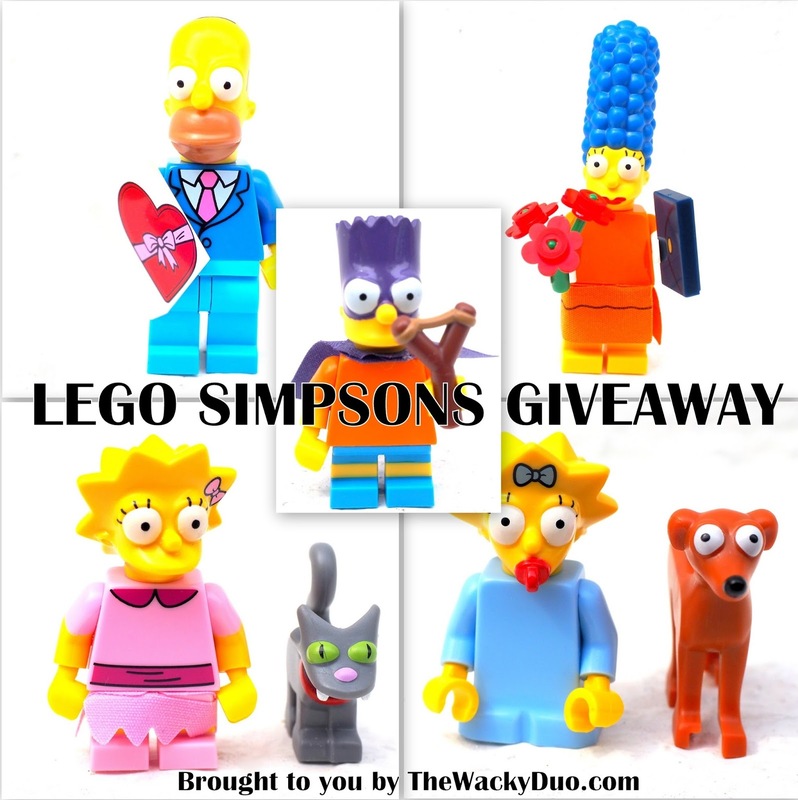 The main giveaway is the 2x2 tiles and Homer's head. The top of the head is smooth with Dr. Hibbert is rough. Marge is ready for a date with Homer in her fancy dress. She would be quite easy to locate with her long head with small protruding round surface. Feel for the 1x2 bag and un-assembled set of 4 flowers to confirm. Bart alter ego Bartman is in this series. The slingshot is a brand new LEGO piece!Feel for the slingshot to confirm. Bartman is the only one with it. Lisa is back with a pink outfit and she brings along the family cat, Snowball II. Snowball II is a giveaway. However it could be similar to Santa's Little Helper. to confirm feel for Lisa leg. Lisa's pokey head is also a giveaway. Maggie looks almost similar to the first series with the exception of the eyes. Santa's Little Helper is probably what makes this pair interesting to collectors. This is the set with the least accessories as Maggie's body comes in one piece. It is quite easy to identify. Other than the obvious Santa's Little Helper, the next tip is get the bag that does not have LEGO Legs! Patty is Marge sister and one pair of a twin. She has one of the largest head in the series which is at least 1.5 times larger than the others. Other than the head, the bag is a good giveaway as it is unique to this series. Selma is the twin sister of Patty and sister to Marge. She has probably the largest head piece in the set which is easily identifiable with its small protruding round shapes. To differentiate with her sister , feel for the 2x2 tiles.Do not be confused with Smiters with a similar (but smaller) head. Milhouse had also appeared in the original LEGO Simpsons series. He is back as as alter ego Fallout Boy. He can be identified by his Buzz Cola cylinder can. A new character in the LEGO Simpsons series and Bart's schoolmate. Apparently he gives Lisa a run for her money in intelligence.Easy to find with the oversize book. Mr Burns personal assistance and best friend makes an appearance. He is holding Springfield most popular doll Malibu Stacy. Collecting toys is his passion! He is the only character with two 2x2 tile. Feel it and he is yours. Springfield ex mayor and senior citizen is in the series. Perhaps he could be best pals with Grampa Simpsons in the future. He has only one 1x2 tile which is a void driver's license. The other character with it in the series is Marge. given Marge distinct head, it will be hard to mix them up. With the appearance of so many Bart's school friends, it is about time his 4th grade teacher is introduced here.The pink mug with 2x2 tile is her calling card. New character Springfield professor joins in the Simpsons Family.His liquid flask is unique to him and easily identifiable. The Comic Book Guy owns a comic store in Springfield.His Quishee bottle with a straw is easily identified. He is also holding a 2x2 Everyman comic tile. Dr Hibbert is Springfield best doctor. He and Homer are almost identical with the exception of his head which is rough on the top. He is aso holding a 2x2 tile similar to Homer. Springfield school groundskepper and janitor. His plunger is easily identified. He comes in 5 per box thus making him one of the easiest person to find in the box. Compared to the earlier Simpsons, this set has lesser familiar faces. The Simpsons family would probably be a familiar fan favourite. We think this set might be less collectable compared to other sets. However if you are a Simpsons fan, you would probably want to collect it. The hardest to get would probably be the ones in 3.You can now get them in selected toy stores and 7 Eleven for $4.90. Do note , this is not a sponsored giveaway, but one out of our own pocket. 2) Follow us on Instagram for 5 more chances! This giveaway is open for facebook fans of The Wacky Duo only. Be a fan here! Giveaway closes on 3rd June. Results will be out here on 5 June. Winners are to respond by 8 June with the required details upon the reply of confirmation email. Prizes will be forfeited if there are no response by the said date. Winners are not allowed to change the prizes or exchange them for cash. Prizes are not meant to be sold or transferable. Thewackyduo.com is not liable for the condition of the prizes indicated including any damage or loss due to postage. PS : We are not sponsored by LEGO to do this review. Nonetheless if LEGO is willing to do a collaboration, we welcome it with open arms. How about a review of the upcoming LEGO Ferris Wheel set for a start ? I can't find these at Vivo Toys R Us... Hope to win this!